In the last few days, Elk Grove residents received an of out-of-the-ordinary campaign mailer in their mailboxes. What made this political mailer unusual was the source of the literature - the City of Elk Grove. 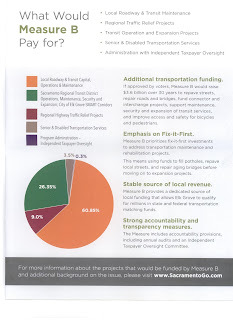 The four-page glossy mailer was sent as an implied endorsement of the one-half cent sales tax being pursued by the Sacramento Transportation Authority's Measure B. Measure B - nicknamed "The Road Maintenance & Traffic Relief Act of 2016" is a county-wide 30 year one half-cent sales tax increase to fund various transportation needs. 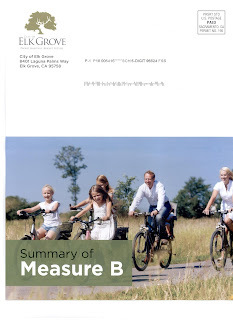 While nowhere on the mailer does the City explicitly urge residents to support the measure - that is against the rules - it does paint a positive portrait of the tax increase complete with a family of white-shirted blonde-haired bicyclist. The informational mailer points out all the benefits not only for the county, never mind the regressive nature of sales taxes, but more specifically, Elk Grove. The list implies there are goodies for almost every constituency in Elk Grove. For Highway 99 commuters there is a lengthened carpool lane; for the environmentally minded there is the promise of more bus rapid transit, sorry, no mention of Light Rail extension in the mailer; a multi-modal station at the fringes of the urban services boundary; and for Laguna residents, a new interchange at Whitelock Parkway and Highway 99 to relieve some traffic along Elk Grove Boulevard. Something for everybody, well almost everybody, in Elk Grove it seems. 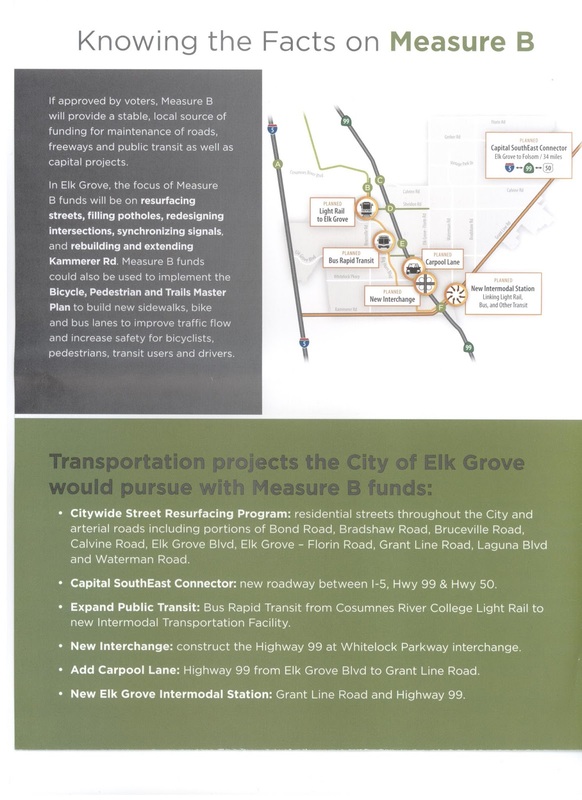 And oh, if there is any money left in Elk Grove's allocation, funds could be used to connect trails and sidewalks. Nowhere in the City's mailer does it mention when in the next 30 years any of these projects might start, much less be completed. Aside from those stakeholders, should Measure B pass, as it relates to Elk Grove, there will be two constituencies who will benefit the most. The first constituency the City is interested in serving is the Elk Grove City Councilmen. As many are aware, for the last several years the City Councilmen have consciously decided not to maintain roads even after being advised by the City's public work director they were playing with fire. That deferred maintenance has a price tag of $8 million annually. Even though the City Council has deferred maintenance, the City has had the funds to pay for maintenance. Instead of taking care of business, the City Council has foolishly pursued several pie-in-the-sky projects that remain nothing but "binders of plans" collecting dust in City Hall. If Measure B fails, the City Council will have to drop some of these schemes and act fiscally responsible. Among the projects that could be funded by Measure B that has both home builders and City Councilmen salivating like dogs is the prospect of financing the extension of Kammerer Road to I-5 and the holy grail of the developers, the 33-mile four-lane Southeast Connector Road between Elk Grove and Rancho Cordova. Should the City Council and home builders get the funding, they will channel David Farragut and say "damn the Elk Grove residents, full speed ahead." 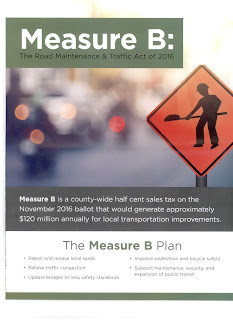 So as you receive the mailers from the City of Elk Grove and the inevitable home-builder sponsored mailers, robocalls and TV and radio commercials espousing the benefits of Measure B, as you would with any initiative or tax measure, before you decide how to vote, ask yourself - Cui Bono - who benefits. No Comment to " Elk Grove Pitches Measure B Sales Tax Increase With Taxpayer Paid Political Mailer "